For us, it’s a simple equation. The more funds raised on our behalf, the more we can help the more than 5,000 people who turn to Vinnies for help every single day. There are all kinds of ways you, your organisation or your school can fundraise for Vinnies. Every day thousands of people turn to Vinnies in their time of need. Some only need a little help and can then continue with their lives, a crisis averted while some may need assistance over a longer time. Others may require professional assistance from our more specialised services. It is only through the generosity of our donors that our members, volunteers and staff can continue to offer the right support at the right time. We thank you for joining with us to provide support and assist in making a difference to the lives of people that we assist. 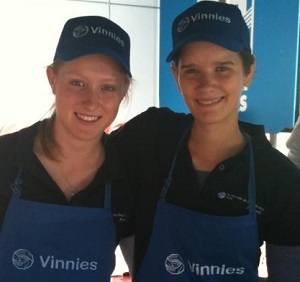 Vinnies hosts a range of fundraising activities, of which the best known is the Vinnies CEO Sleepout, closely followed by Vinnies Community Sleepouts and Vinnies School Sleepouts. Every night, about 100,000 Australians are in need of shelter, and Vinnies is fighting to halve this number by 2020. Vinnies Community Sleepouts are a great way of bringing that statistic to life while raising funds to help those people who need it the most. Simply click on one of the links below for details on how best to Fundraise in your state or territory. Alternatively you can visit the Events section of this website to find out more about events in your local area.